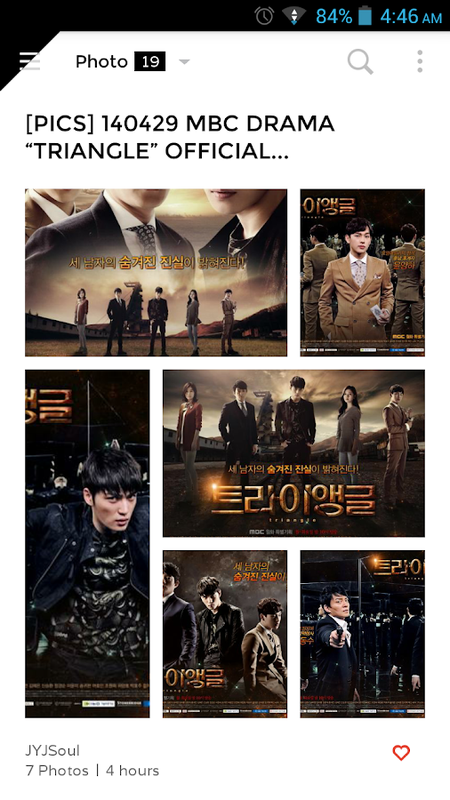 • Get the latest updates from the JYJ boys. • The only app you need to bring you closer to your idol groups. • Flip across all the latest news and social media updates,pictures and videos, updated real time. • Only want to watch videos? Just click a simple button and we willsort it out for you. Make sure to turn the frown upside down. Add stuff to yourfavorites if you like something. 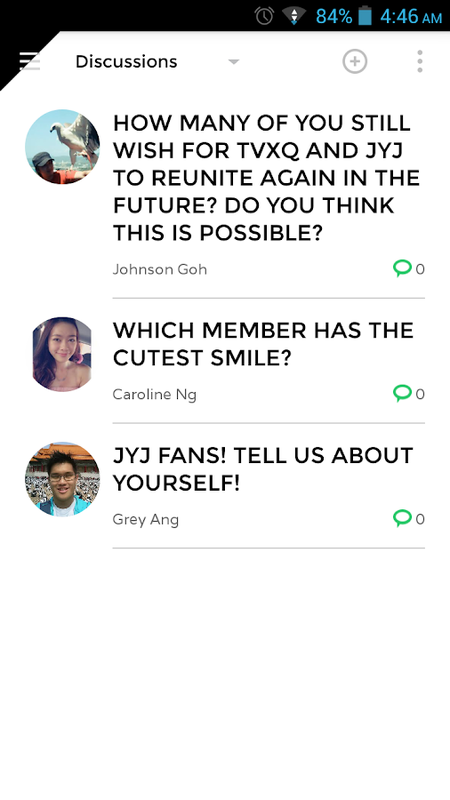 Download JYJ (KPOP) Club today! It's free! Escape to the world of Bangtan Boys (KPOP)Club• Get the latest updates from the Bangtan Boys.• Clean and minimalistic design so that you get to see updates thatmatter• The only app you need to bring you closer to your idol groups.New Features• Saw something exciting? Discuss about it with other clubmembers• Flip across all the latest news and social media updates,pictures and videos, updated real time.• Only want to watch videos? Just click a simple button and we willsort it out for you.Fun FactMake sure to turn the frown upside down. Add stuff to yourfavorites if you like something.Download Bangtan Boys (KPOP) Club today! It's free! Escape to the world of BEAST/B2ST (KPOP) Club• Get the latest updates from the B2ST boys.• Clean and minimalistic design so that you get to see updates thatmatter• The only app you need to bring you closer to your idol groups.New Features• Saw something exciting? Discuss about it with other clubmembers• Flip across all the latest news and social media updates,pictures and videos, updated real time.• Only want to watch videos? Just click a simple button and we willsort it out for you.Fun FactMake sure to turn the frown upside down. Add stuff to yourfavorites if you like something.Download BEAST/B2ST (KPOP) Club today! It's free! Escape to the world of INFINITE (KPOP)Club• Get the latest updates from the INFINITE boys.• Clean and minimalistic design so that you get to see updates thatmatter• The only app you need to bring you closer to your idol groups.New Features• Saw something exciting? Discuss about it with other clubmembers• Flip across all the latest news and social media updates,pictures and videos, updated real time.• Only want to watch videos? Just click a simple button and we willsort it out for you.Fun FactMake sure to turn the frown upside down. Add stuff to yourfavorites if you like something.Download INFINITE (KPOP) Club today! It's free! Escape to the world of BIGBANG Club• Get the latest updates from the BIGBANG boys.• Clean and minimalistic design so that you get to see updates thatmatter• The only app you need to bring you closer to your idol groups.New Features• Saw something exciting? Discuss about it with other clubmembers• Flip across all the latest news and social media updates,pictures and videos, updated real time.• Only want to watch videos? Just click a simple button and we willsort it out for you.Fun FactMake sure to turn the frown upside down. Add stuff to yourfavorites if you like something.Download BIGBANG (KPOP) Club today! It's free! 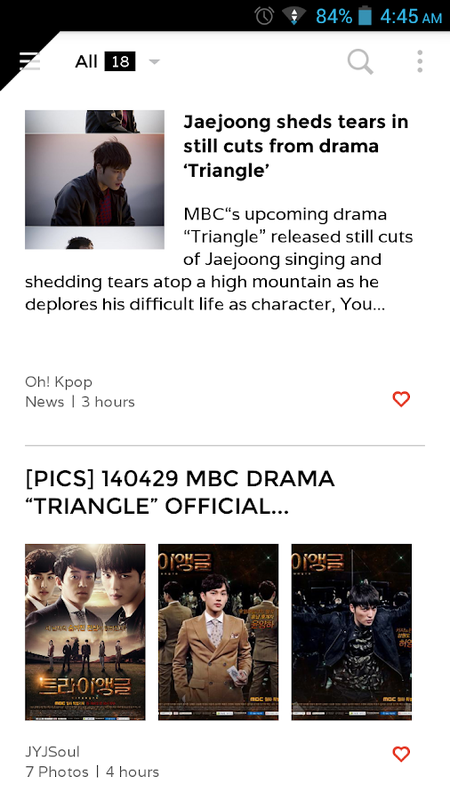 Escape to the world of JYJ (KPOP) Club• Get the latest updates from the JYJ boys.• Clean and minimalistic design so that you get to see updates thatmatter• The only app you need to bring you closer to your idol groups.New Features• Saw something exciting? Discuss about it with other clubmembers• Flip across all the latest news and social media updates,pictures and videos, updated real time.• Only want to watch videos? Just click a simple button and we willsort it out for you.Fun FactMake sure to turn the frown upside down. 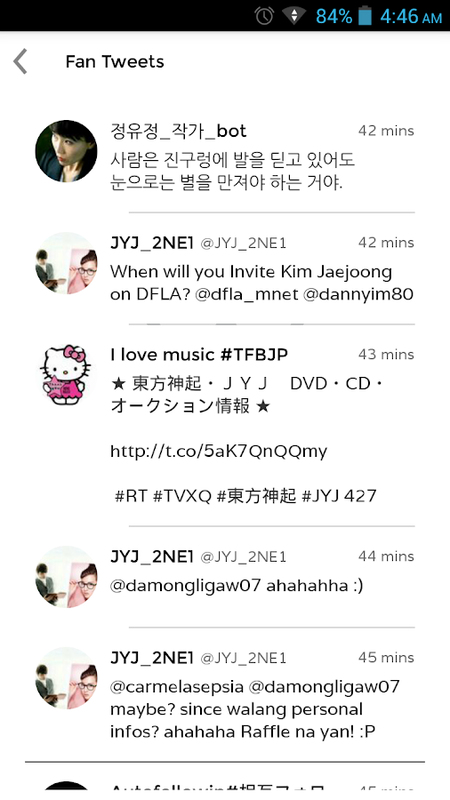 Add stuff to yourfavorites if you like something.Download JYJ (KPOP) Club today! It's free! Escape to the world of 2NE1 (KPOP) Club• Get the latest updates from the 2NE1 girls.• Clean and minimalistic design so that you get to see updates thatmatter• The only app you need to bring you closer to your idol groups.New Features• Saw something exciting? Discuss about it with other clubmembers• Flip across all the latest news and social media updates,pictures and videos, updated real time.• Only want to watch videos? Just click a simple button and we willsort it out for you.Fun FactMake sure to turn the frown upside down. Add stuff to yourfavorites if you like something.Download 2NE1 (KPOP) Club today! It's free! Escape to the world of B.A.P (KPOP) Club• Get the latest updates from the BAP boys.• Clean and minimalistic design so that you get to see updates thatmatter• The only app you need to bring you closer to your idol groups.New Features• Saw something exciting? Discuss about it with other clubmembers• Flip across all the latest news and social media updates,pictures and videos, updated real time.• Only want to watch videos? Just click a simple button and we willsort it out for you.Fun FactMake sure to turn the frown upside down. Add stuff to yourfavorites if you like something.Download B.A.P (KPOP) Club today! It's free! Escape to the world of 2PM (KPOP) Club• Get the latest updates from the 2PM boys.• Clean and minimalistic design so that you get to see updates thatmatter• The only app you need to bring you closer to your idol groups.New Features• Saw something exciting? Discuss about it with other clubmembers• Flip across all the latest news and social media updates,pictures and videos, updated real time.• Only want to watch videos? Just click a simple button and we willsort it out for you.Fun FactMake sure to turn the frown upside down. Add stuff to yourfavorites if you like something.Download 2PM (KPOP) Club today! It's free! クイズ検定　JYJ　バージョンです。結成やメンバーに関するオリジナルクイズです。アプリ画面の右下にある「このアプリについて」をクリックすると表示される画面の、公式Webサイト、Facebook、Youtube、TWITTER、Tumblr等へのリンクから、最新情報をいつでもチェックできます。JYJ（ジェイワイジェイ)のメンバーは、キム・ジュンス（kim jusu、김준수、金俊秀）キム・ジェジュン（kim jaejoong、김재중、金在中）パク・ユチョン（ParkYuChun、朴裕仟、박유천）です。正式名発表前の仮称は「JUNSU/JEJUNG/YUCHUN」（ジュンス/ジェジュン/ユチョン）でした。2010年、東方神起のメンバーであったキム・ジュンス、キム・ジェジュン、パク・ユチョンの3人により結成されデビューしました。Itis a quiz test JYJ version.It is an original quiz about theformation and members.In the lower right corner of the applicationscreen of the screen that appears when you click on the "About thisapplication", the official Web site, Facebook, Youtube, TWITTER,from links to Tumblr, etc., and you can check the latestinformation at any time.Members of JYJ (Jay Jay Wai) is,Kim Jung(kim jusu, 김준수, Toshihide gold)Kim Jae (kim jae joong, 김재중, goldabsentia)Park Yoochun (Park YuChun, BokuHiroshi仟, 박유천)Itis.Official name announcement before the tentative name was "JUNSU/ JEJUNG / YUCHUN" (Jung / JJ / Yuchun).2010, Dong Bang Shin Kimembers a that was Kim Junsu, Kim Jaejoong, it debuted has beenformed by three of Park Yoochun. Escape to the world of TVXQ (KPOP) Club• Get the latest updates from the TVXQ boys.• Clean and minimalistic design so that you get to see updates thatmatter• The only app you need to bring you closer to your idol groups.New Features• Saw something exciting? Discuss about it with other clubmembers• Flip across all the latest news and social media updates,pictures and videos, updated real time.• Only want to watch videos? Just click a simple button and we willsort it out for you.Fun FactMake sure to turn the frown upside down. Add stuff to yourfavorites if you like something.Download TVXQ (KPOP) Club today! It's free! "V" is an app that lets you watch the personal broadcasting videosof celebs on your phone. You can follow your favorite celebs, watchtheir videos, and use comments and ‘hearts’ to share your thoughtsand feelings with others. Your activity such as watching videoswill affect your "Chemi-beat" for the celeb; we plan to providebenefits to active users who enthusiastically participate in theactivity. Scheduled shows will be listed on V before they start;however, shows that a celeb personally broadcasts can be on airwithout any advance notice. Enjoy watching live broadcasts of yourfavorite celebs on V! * Follow Celebs Pick your favorite celebs andfollow them. You can receive the notifications of upcomingbroadcasts of celebs you follow on V. The more you watch the videosof a celeb, the higher you get "Chemi-beat" for the celeb. *Popular ChannelsBIGBANG,SMTOWN,BTS,YGFamily,iKON,Apink,WINNER,GOT7,INFINITE,BTOB,BEAST,AOA,SISTAR,CNBLUE,missA,Girl's Day,2PM,JYPnation,4minute,VIXX * Upcoming You can see theschedule for all upcoming broadcasts on V. Don't miss the broadcastwith your favorite celebs! * Popular In the Popular tab, you cansee the most popular videos on V. Videos containing a lot of heartsare automatically displayed in the Popular screen; tab the heart asmany as possible if you like what you are seeing. * What does"Chemi-beat" mean? As a short form of "chemistry beat," the V teamcoined the word "Chemi-beat" to express the relationship indexbetween a celeb and me as beat count. Following celebs and watchingvideos (live or recorded) are ways to increase your "Chemi-beat. "We plan to provide additional benefits based on "Chemi-beat" in thenear future. When APP could not be installed, device setting ->Selecting Google play from APP menu and retry after deleting data.• Camera (required): This lets you take photos or record videos toshare on the profile or boards. • Microphone (required): This letsyou record sound of your videos to share on the boards. • Phone(required): This lets V LIVE recognize your device using the deviceID when enabling automatic login, sending push notifications, orwatching paid content. • Storage (required): This lets you publishphotos on your device to the profile or save them to your device. K-pop Music is the best free app for Android to listen the bestkpop hits online. Includes a well organized and curated videoplaylist of K-pop songs and a kpop music player.Do you want tolisten Korean pop music, K-pop song trending hits, Kpop radiomusic, K-pop love songs and more? With this app you can enjoy thebest of kpop music video trending hits in the market.Enjoy watchingour free Kpop music videos!! Remember your favorites tracks withour K-pop music included in the app. Are you a K-pop trending hitsmaniac?If you are a Kpop / K-pop fan you will love this free app! !The best Korean Pop music player.Share videos of the best kpopmusic songs on Facebook, WhatsApp, Twitter and Google+. Show thatyou're a big K-pop fan. 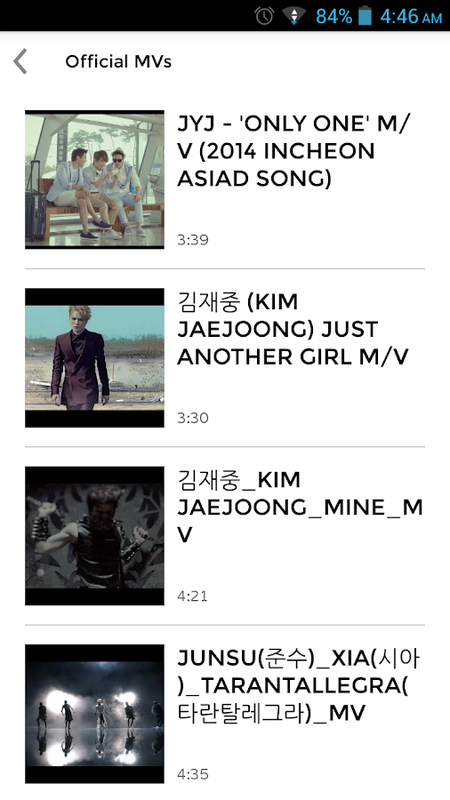 Play videos in the application, remember,it is not music to download!The app is updated frequently, continuecollecting as many kpop music video and songs as they are released.We are a big kpop fans and want to share our love for KoreanMusic!DISCLAIMER: K-pop Music hasn't got the intelectual propertyfrom the included videos and songs. You can't download thecontent.It only plays publics videos hosted in YouTube. Do you love KPOP? If yes, this is for you! Here are some specialfeatures: - Easy to use and cute interface - Fast steaming by usingYouTube API - Top Special categories: LATEST, POPULAR, SEARCH, TVSHOW, DRAMA OST, FAVORITE - Watch and search lastest music videoeverytime and everywhere - Add your favorite music video & TVshow to your list - Notification for every new release music videoand TV show - Supporting almost all kinds of resolutions - Add thelatest every week. *** COMPLETELY FREE 100% *** So what are youwaiting for? Download this app now!! !